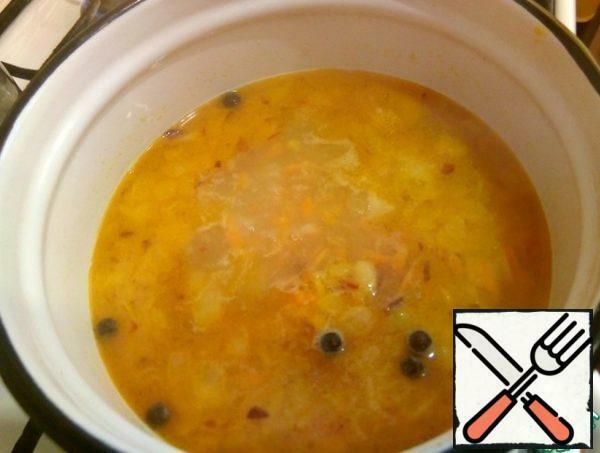 My mom loves sour cabbage soup! 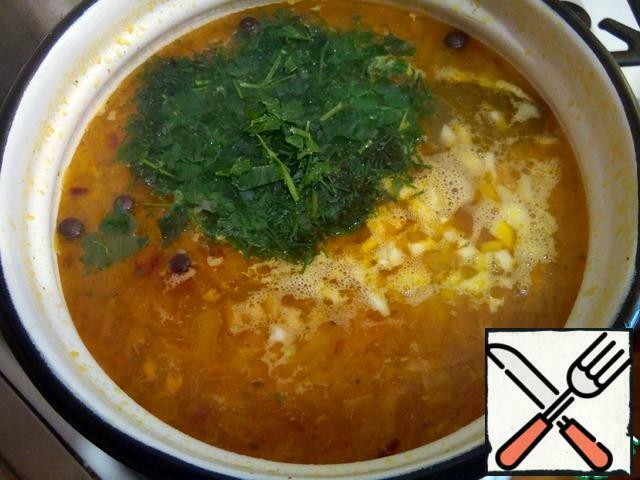 Although juicy and very hearty soup with pleasure will eat all members of a household. I will share with you a recipe for cooking delicious Lenten soup, it is quite simple. The soup is thick, flavorful filling. 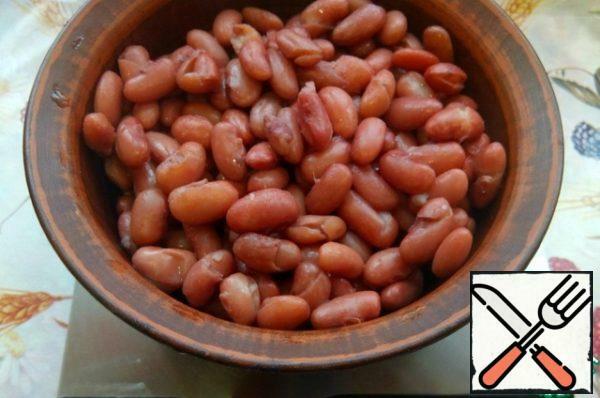 Here is the beans after cooking with one cup (250 ml) of dried beans turns 425-430 grams of boiled beans. 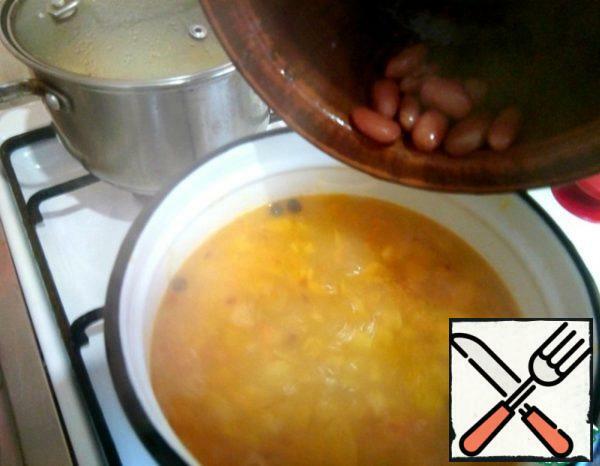 You can add in the soup the whole portion or half, depends on how thick soup you prefer.You can also take canned beans. We put cabbage in a saucepan, add 500 ml of water. 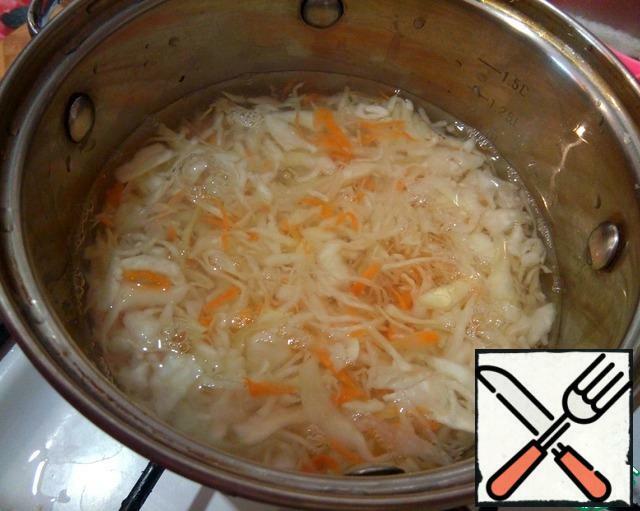 Then bring to a boil, reduce the temperature to low and cook for 30-40 minutes. While the cabbage is boiled, put it on the stove a pot for soup with 1.5 liters of water. Put the frying pan to the heat to sauteed vegetable. 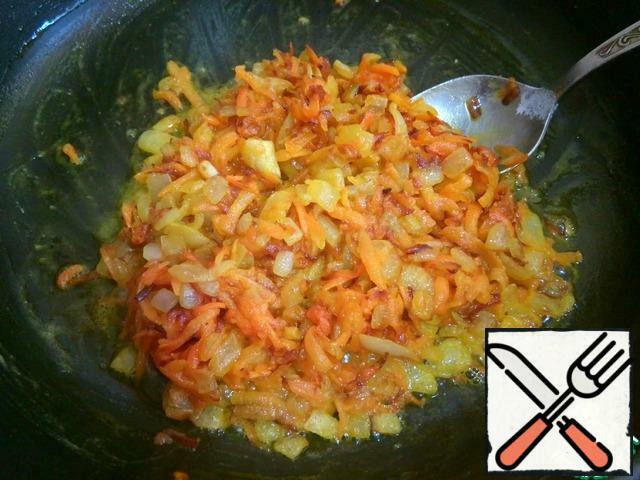 Clean the carrots, onions. Carrots grate on a coarse grater, onion cut into small dice. 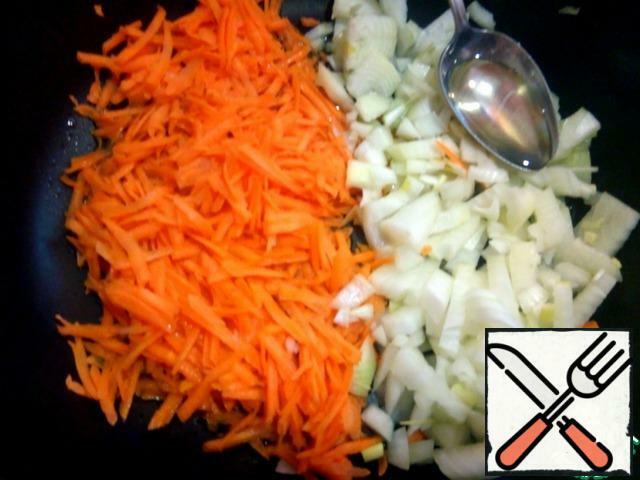 send vegetables to the pan with the addition of 3 tablespoons of oil, stew vegetables on low heat. 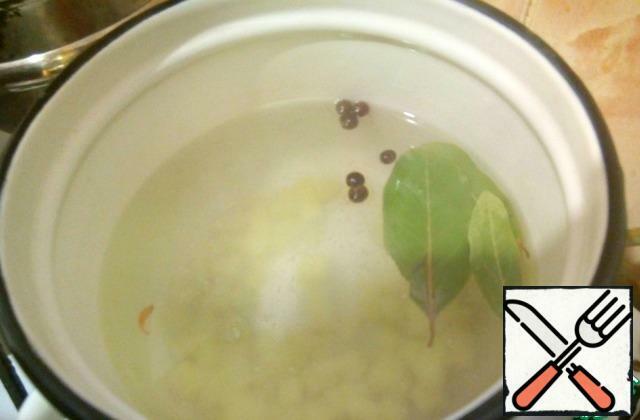 Clean the potatoes,and then cut into a small cube, send in boiling water, add Bay leaf and allspice. Cook until potatoes are ready. 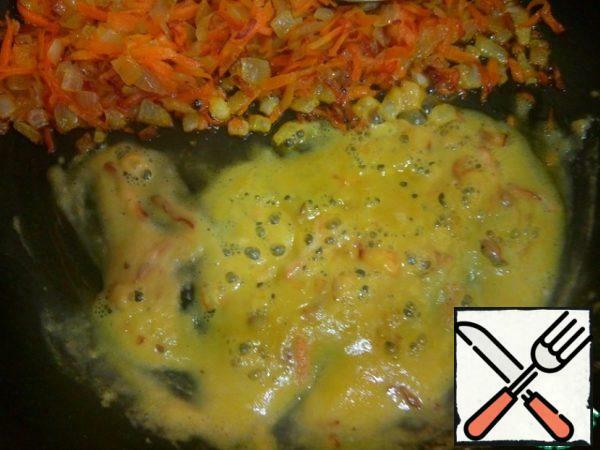 As soon as the vegetables begin to fry slightly, shift them to the side and add a spoon of flour, distributing it in one layer. Flour has long been added to lean soup for satiety. If required add a spoon of oil to avoid lumps, fry the flour for about a minute. 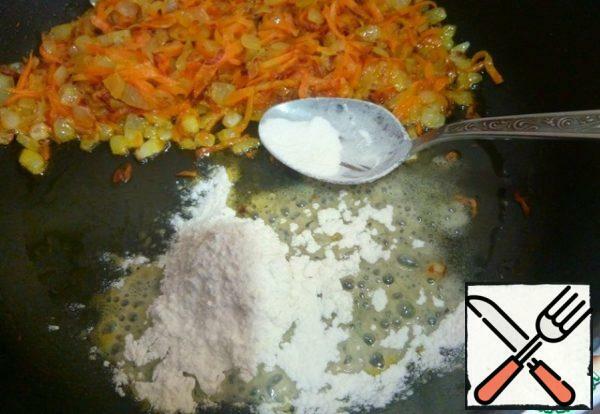 Then mix the vegetables together with the flour. We send our vegetables to the pot with potatoes. We try a piece of potatoes,for to know that cooked. Add to the pot beans, bring to a boil. 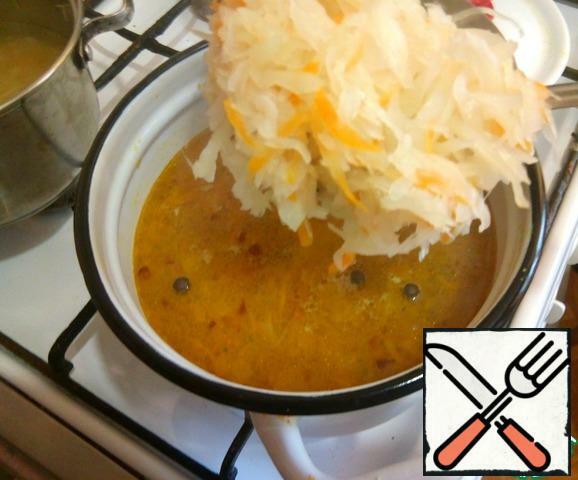 Now with a slotted spoon put the cooked sauerkraut into the general pot with the vegetables, bring to a boil. 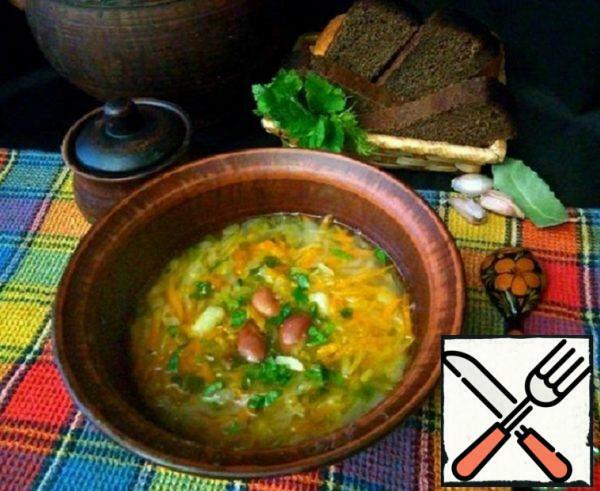 Try the soup to taste, sprinkle with salt and add the broth from the cabbage regulate the acid of the soup to your liking. Finally, add finely chopped garlic, herbs and turn off the stove. Cover the soup with a lid and let stand for 10 minutes until we cover the table. Serve the soup to the table. In a plate you can separately add the chopped herbs and crushed garlic.